What do you think of when you think of traveling? Excitement? Relaxation? Comfort? I used to, but long term traveling is a different story. Down time. Sitting around. Hurry up and wait. And most of all, transportation. Buses, boats, trains, planes, you name it. Our time in Asia added up to 222 days, or 5,328 hours. 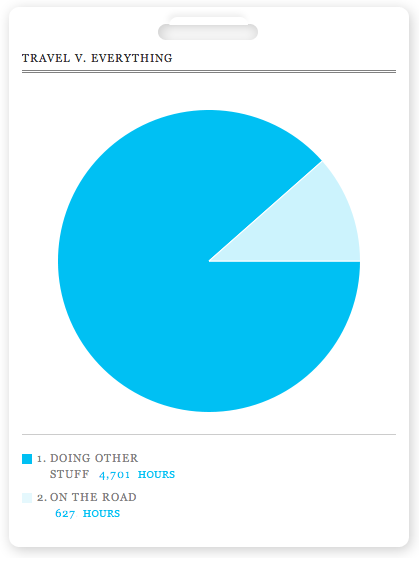 Of this, 627 hours were spent traveling. That’s about 26 days, and 12% of our total travel time. We used whatever transportation was available to us. 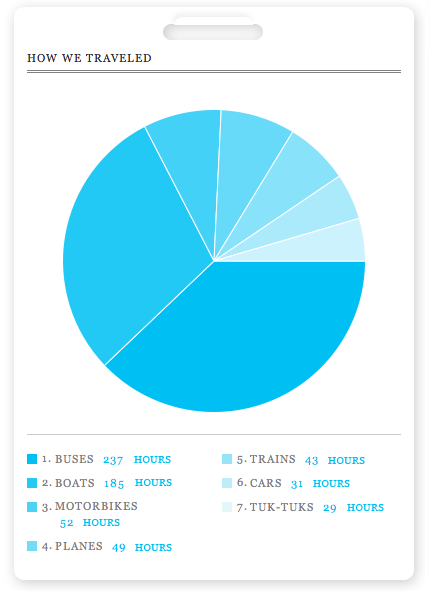 In Vietnam we traveled mostly by bus — in fact, overall we traveled mostly by bus: 237 hours total. Cambodia was a combo of bus, boat (across the Tonle Sap) and tuk-tuk. Although they go by different names — tuk-tuks, tricycles, auto rickshaws — they’re all motorbikes with some sort of extra seating, like a cart, attached to the back or the side. In Laos, Thailand and Malaysia, by bus. Philippines by bus and tricycle. And of course, we spent a lot of time on different kinds of boats — both island hopping and diving. The boats ranged from speedboats to bamboo bankas, large wooden Chinese junk boats to freighter ships used as ferries. Travel by car was few and far between. Then there are planes. What isn’t represented here is the amount of time lost checking in at an airport, going through security, sitting around waiting for boarding. Flying was probably my least favorite way to travel. By then end of the trip, a 16-hour bus ride no longer seemed daunting, flying almost seemed like cheating, and we no longer needed anti-motion-sickness pills on boats. Traveling with multiple connections and complicated routes sharpened our senses and increased our ability to act quickly and observe our surroundings closely. Sitting for hours on buses gave us time to reflect on the past and to think about the future. It’s this down time, the time spent quietly and stationary that I felt I got to know myself in a new way, without the distractions of everyday life. It’s when I had the chance to ask myself hard questions and have time to search for the answers inside. While the active, exciting moments of a long trip may form your clearest memories, it’s the quiet moments of reflection that really shape the new person you may feel like when you arrive home.